January 28, 2010  President Obama announced Thursday $8 billion in grants for high-speed rail projects around the country. The White House says the projects are expected to create or save tens of thousands of jobs. January 23, 2010  Jacmel, Haiti's fourth-largest city, is one of the country's few tourist destinations and its arts center. The city suffered considerable damage and lost important members of the art community. January 20, 2010  When the massive earthquake shook Haiti last week, the port city of Jacmel was largely cut off from the rest of the country. Jacmel is Haiti's fourth-largest city and its cultural capital. It was not as severely damaged as the capital Port-au-Prince but suffered its share of tragedy. January 19, 2010  Jacmel, 20 miles south of Port-au-Prince, was once the jewel on Haiti's southern coast. 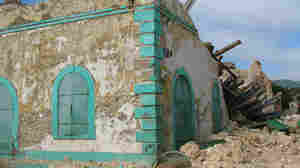 Now, the city, known for its colorful French colonial architecture and quiet beaches, is in ruins. Emergency help arrived in Jacmel last Friday, three days after the deadly quake. January 18, 2010  NPR's Greg Allen visits the growing field of mass graves, where thousands of Haitians are being buried after last week's devastating earthquake. January 18, 2010  Last week's earthquake in Haiti has left many survivors homeless. Some have turned to sleeping on the street, in parks and other open spaces. 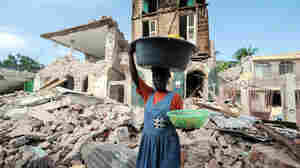 January 17, 2010  NPR's Greg Allen profiles one of those who survived the quake but now is struggling to stay alive in its aftermath, battling for food and water in Haiti's devastated capital. January 16, 2010  Haiti's already limited medical infrastructure was all but wiped out in the earthquake. Aid groups and the international community are rushing doctors and medical supplies to the country. Meanwhile, patients with compound fractures, severe lacerations and amputations are sleeping outside Port-au-Prince's main hospital as they wait for treatment. January 15, 2010  A woman was pulled alive from the wreckage of her home after spending more than three days buried alive. She was taken to Haiti's National Hospital, which has been overwhelmed with people in need. January 15, 2010  Haitians are trying to come to grips with the aftermath of Tuesday's 7.0 earthquake. The United Nations says the quake has affected as many as three million people. In devastated neighborhoods, bodies are laid out unceremoniously on the side of the road — sometimes they are wrapped in sheets. January 13, 2010  Haiti has many connections to the United States, connections of both family and business. Just as the earthquake struck, some people were preparing for a flight to Miami. The plane managed to take off before the airport was shut down, and they touched down safely in the U.S.
January 12, 2010  Florida is in the grip of its worst cold spell in more than a decade, and that means trouble for the state's fruit and vegetable growers. Farmers in some parts of the state are bracing for substantial losses. January 8, 2010  Conservatives in Florida's Republican Party forced out the party's chairman and are now pledging to block his successor, hand-picked by party leaders. It all spells trouble for Florida's moderate Republican governor and U.S. Senate candidate, Charlie Crist. 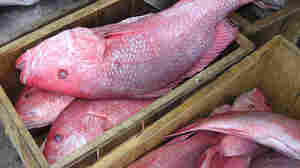 January 6, 2010  As red snapper populations along the southeast coast continue to decline, fisherman who depend on the stock are finding themselves at odds with the federal government and scientists who are working to overcoming years of overfishing. January 1, 2010  Many states want to avoid raising taxes on residents during a recession. But with widespread budget deficits, states are trying to increase revenue by turning to special fees -- on hunting and fishing licenses, for example -- or by increasing taxes paid by visitors on hotel rooms and rental cars.